With so many modern homes out there these days, it can be a sight for sore eyes when you see a traditional house that embraces its culture by using scrap building materials. This is the Omah Amoh, located Indonesia that uses these materials so that the cost is kept low but the outcome is still beautiful. The word amoh means obsolete or broken in Javanese and Omah Amoh generally means an outdated or damaged house. 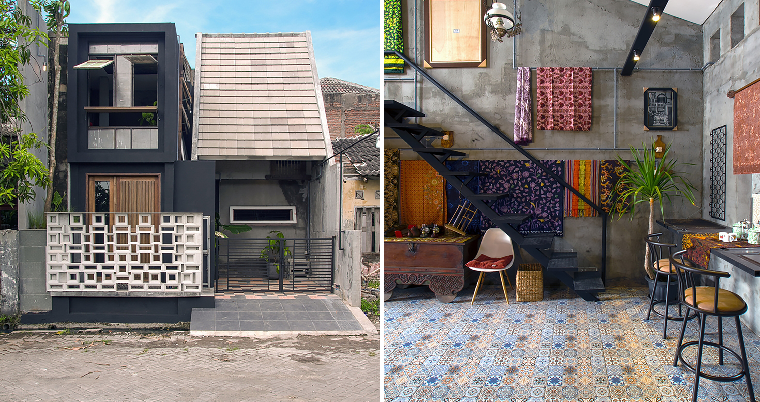 However, this doesn’t mean that the house is actually derelict but it is rather old so the designers, Gayuh Budi Otomo thought up this awesome design as the homeowner did not want to cause a hole in his pocket. The Omah Amoh is designed to be more of a communal home instead of an individualistic one so you can see that almost all the rooms are created for groups of friends or family to gather and hang out. It is located in a poorer neighbourhood but that doesn’t mean it cannot be stunning as well with two blocks and a long, sloping roof. All sorts of materials are repurposed for the house and traditional elements can be seen everywhere, such as the floor which has colourful patterned tiles. A more industrial look is kept on the walls, as it is an unfinished concrete style which makes it look more rugged. There are two levels in this house and along the way, colourful, vibrant fabrics hung around the place to make it look more vivid. The lightings are bare but functional and cast a pretty glow that illuminates the house. Water pipes are also used as power lines that is no-frills and is really handy. It is a very warm and welcoming home that will open its arms to any visitor who wants to drop by and hang out as all the spaces are kept communal.